The TL1000S is no longer being made or officially imported to the UK. 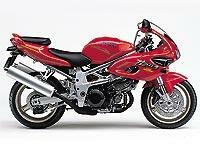 Stocks of the Suzuki sports twin you now find in dealers are the last there is. And although the TL1000R will remain in production for the short term, a spokesman for the firm in Britain has hinted it is also on borrowed time.
" There are no plans to replace the TL1000S and none to continue in the V-twin market as far as I am aware, " he said. The TL1000S has been with us for five years. It was launched as the first Japanese V-twin to take on Ducati head-to-head. Its combination of a monstrously torquey V-twin, low weight and short wheelbase gave early machines a reputation as a tank-slapping beast – a reputation the bike has failed to shake. Even the early addition of a steering damper failed to revive sales, and Suzuki launched the heavier TL1000R just one year later – solving the handling problems but losing much of the original machine’s heart-stopping wheelie potential. The TL1000R – which was intended to replace the GSX-R750 as the firm’s main superbike racer, never reached the track. It is also nearing the end of its life. The Suzuki GB spokesman said: " The TL1000R will continue to be sold, but if you want a TL1000S, you had better be quick – the last stocks are in dealers now. " Despite the decision to drop the bike, the engine will remain in production. It has become a firm favourite with specialist firms, providing power for machines like the Bimota SB8R, while Cagiva will continue to buy them to use in the Raptor and Navigator. How much can you get a TL1000S for now? Check MCN Bikemart TM for the latest prices.